I’ve spent some time studying Zepfanman.com reports from Google Analytics, a tool I’ve been using for the past year. Without redesigning the site, I’ve taken cues from the reports to update some old posts and make the site load a little faster. You might call it spring cleaning. With less than 900 views a month, I don’t really need to fine tune the site, but hopefully some of you with your own websites will find a helpful nugget or two here. Updates (if needed) to the most popular blog entries. E.g. Lala Music Mover uploads your whole collection & Best resources for puppy training? Cleanup of pre-2009 pages that still get a lot of traffic. This was the most time-consuming part. Yahoo! deactivates accounts without warning (consistently over 30% of pageviews on the whole website), Led Zeppelin Discography, and others. While I was thinking about it, I also updated my 404 page. New WordPress plugins to shorten page load time. While I liked the interactive nature of the FriendFeed Real-time Widget, it made my site load too slowly; the FriendFeed Activity Widget plugin is faster, but not nearly as pretty. I’ve also started using the WP Super Cache and Use Google Libraries plugins (which I don’t completely understand but I do recognize their positive effect on higher-traffic sites). Finally, I moved any embedded media (like YouTube vids) off the home page. Check out the short WebPageTest analysis below to see how I improved from 7.5 to 5 second pageload time on a 1.5 Mbps (DSL speed) connection. I had wanted to expand the History page before this week’s Tuesday Zep, but wasn’t able to get around to it. I’ll work on it in the next couple of days. 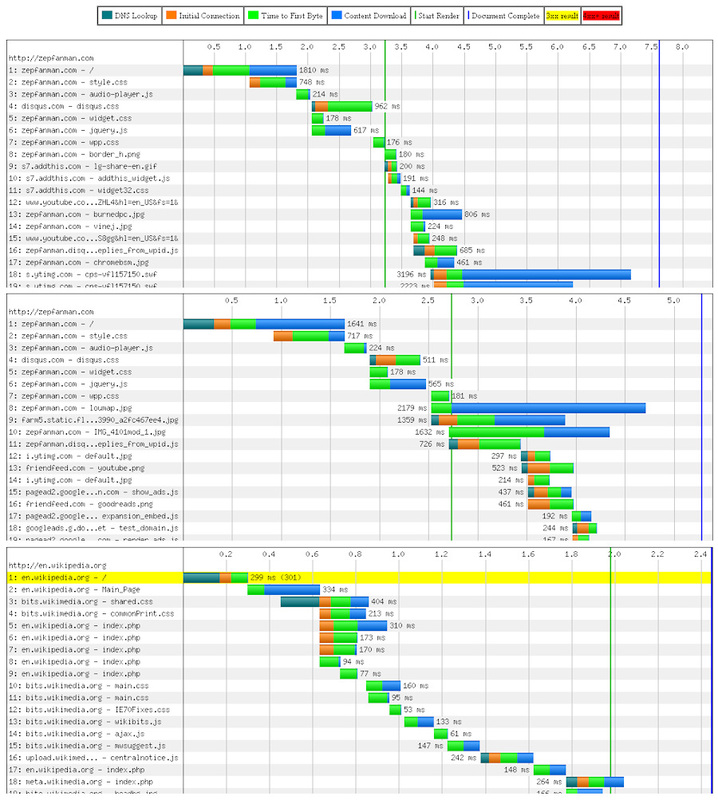 I was quite pleased to find WebPageTest to get an idea of my pageload times. 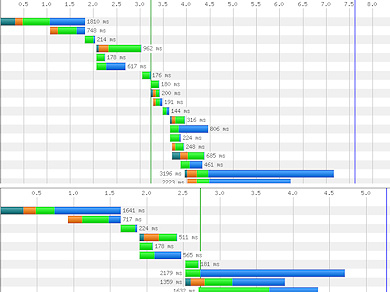 If you click on the graphic above, you can see the full image of my site load times before and after optimizing as well as a comparison to Wikipedia. The green line is when the page starts rendering and the blue line is when the full page has loaded. When I first used it earlier this month, there was an option to test at dial up speeds, as well. For some reason, that option isn’t there now. While dial-up visits only account for about 1.5% of my site visits, I can sympathize with the frustration that a slow pageload will induce! Saving half a second to 3 seconds may not seem like much of an improvement, but I can imagine that would amount to at least 8 to 60 seconds on dial-up. Click on each test to see full results, including video snapshots of the pages loading. Dial-up US: 26.9 start, 163.7 complete; 8.8, 25 on second view. I could speculate on what each stat reveals, but I’d want to talk to an expert before attempting to explain it here. Since that won’t be happening any time soon, I’ll likely keep researching the topic on my own from time to time, but as you can imagine, the techniques are constantly changing. P.S. Sorry to those getting my feed for publishing this prematurely while still a draft! I forgot to change the status to “Draft” mode while editing and accidentally published it on Monday afternoon.